The Notorious Conor McGregor is a UFC and MMA icon. His ability to trash talk opponents is legendary. I, myself, will admit that I have been amused by all the McGregor hoopla and the inevitable antics surrounding his every fight. There is no one in the world of MMA who can promote a fight like him. However, this time he took his trash talk too far. UFC 229 was the biggest fight card in the MMA world in quite some time. The fight between Conor McGregor and Khabib Nurmagomedov was the main event of this card. I was expecting this fight to be a back-and-forth battle to the end. In reality, this fight was dominated by one man. I was cheering for Khabib, so I enjoyed every moment of this catastrophic beating. However, if I were a neutral fan, I would be disappointed with the outcome and aftermath of this fight. If you didn’t watch or hear about the fight, then I’ll give you a round-by-round recap. In the first round, Nurmagomedov instantly wrestled McGregor to the ground. Conor did a good job sitting up against the cage and avoiding damage. Nevertheless, Khabib dominated a slow and fairly uneventful 1st round. The 2nd round was a bit more entertaining. Khabib landed a vicious hook at the beginning of the round. This rocket of a punch knocked McGregor to the ground. Conor quickly got back on his feet and landed a powerful knee to the face of Nurmagomedov. Nonetheless, Khabib instantly utilized his elite wrestling and picked up McGregor, and slammed him down onto the mat. Khabib dominated the rest of this round and picked McGregor apart with a vicious ground-and-pound attack. At one point in the 2nd round, Khabib was standing over McGregor and landing brutal punches repeatedly to the face. 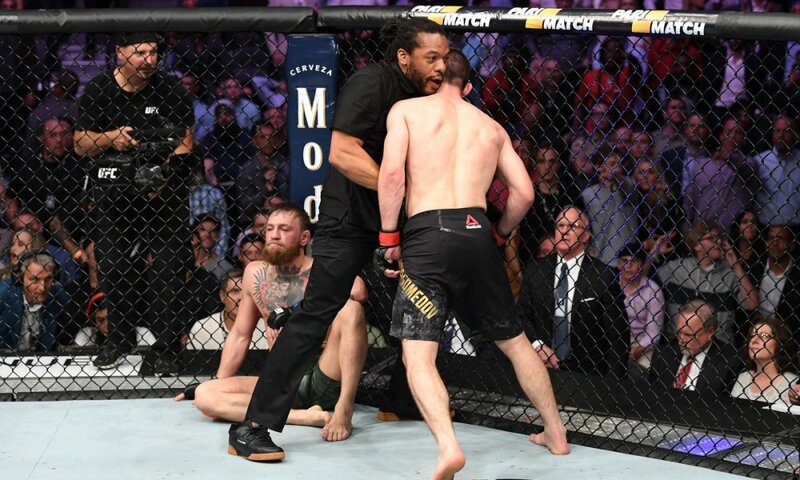 Conor is lucky that Referee Herb Dean did not stop the fight during this onslaught. The only meaningful strike that Conor landed during this attack was an illegal knee to the head while Nurmagomedov had top position on the ground. McGregor also hooked his toes deep into the cage which is illegal in the UFC. But McGregor did show the heart of a champion and got back on his feet at the end of the round. The fact that Conor got back to his feet after taking such a vicious beating shows that the man can take a punch—or 20. The third round was the only round that McGregor showed any real ability to fight back. He started to land a variety of punches and it seemed like he was gaining confidence. Nonetheless, the fatigue from the first two rounds appeared to affect the power behind Conor’s punches. In other words, his punches looked soft. Khabib was literally standing in front of Conor and showed no fear. At one instance, Nurmagomedov actually taunted McGregor after “The Notorious” had just landed a series of punches. Khabib looked tired at the beginning of this round but he found his legs again and regained his composure. Khabib landed a good amount of shots during this sequence and scored a nice take-down at the end of the round. All in all, this round was the only time the match looked like a real fight. Both competitors landed good shots but neither fighter landed any significant strikes. The 4th round was much like the 1st and 2nd rounds—until it wasn’t. Nurmagomedov again took Conor to the ground and controlled the fight from the ground position. Khabib landed more punches to the head of McGregor via the ground-and-pound. All Conor could do to defend himself is illegally grab the cage with his hands. Khabib eventually took control of McGregor’s back and locked in a neck crank. The Notorious tried his best to hold on but tapped out after about five seconds of the choke being locked in, this is how the fight ended. I expected more out of McGregor in this fight. Plain and simple: The man got dominated. As a UFC fan, this fight left me wondering if Conor really is an elite fighter or the company’s best fight promoter. Back in 2015, during his rise to stardom, Conor was a dangerous man. When he beat Jose Aldo in 13 seconds he proved how good he was. Nevertheless, in current times, he has lost two out of his last four fights. Even though I was cheering for Khabib, I wanted to see a more competitive fight. I was very disappointed in the performance by McGregor. But the story has just started. Immediately after victory, Khabib spit at Conor, threw his mouthpiece at Dillon Danis, McGregor’s jiu-jitsu coach, and climbed outside the octagon to attack Danis. Before he dove off the ring, he yelled something along the lines of “you were the one talking about my Dad” at Danis. Furthermore, one of Khabib’s coaches threw a punch at Conor inside the octagon. I am not here to defend the actions of Nurmagomedov, but I do understand why he did what he did. First off, no one should jump into the crowd and try and harm another person in any sport. This creates an extremely dangerous situation for all parties involved. And most importantly, it puts the fans at serious risk of injury. I am not sure what the correct punishment is for Khabib. I hope Dana White doesn’t strip him of his title because he is clearly the best fighter in the lightweight division. Nonetheless, the man deserves to be punished. However, McGregor and his team talked smack about Nurmagomedov’s dad, country, and religion. This was not just a fight for Khabib, this was personal. When Khabib said in a pre-fight interview that he “wanted to change his face” he meant it. I understand that trash-talking is a huge part of the fight game but there needs to be limitations of what can be said. When you start talking bad about another person’s family, nationality, and religion, a line has been crossed. Comments like these are wrong and have no place in sport or life. If the UFC continues to promote fighters who utter ethnically insensitive comments, the brand will suffer as a whole. All in all, UFC 229 was quite a spectacle. I will never forget seeing Nurmagomedov jumping over the cage and flying into the crowd. But this is the sad thing about the fight. This fight should be remembered by Khabib’s dominant performance, but it will always be overshadowed by the post-fight melee. However, Conor got what he deserved and found out the harsh lesson of what happens when you say the wrong thing to the wrong person. I hate to admit it, but I’m already excited for the next McGregor fight.